John Curtis: the Republican congressional hopeful, one-time watch salesman and ... sock enthusiast? Provo mayor has politics in his genes. He also married into the game. (Leah Hogsten | Tribune file photo) John Curtis in Provo on December 29, 2009. Curtis will take the oath of office next week to become Provo's new mayor, replacing Lewis Billings. (Tribune file photo) Provo Mayor John R. Curtis grabs Brigham Young University mascot Cosmo Cougar's tail at LaVell Edwards Stadium Friday May 7, 2010. Playing with Cosmo was one of many activities Curtis did on his 50th birthday to debunk a website's declaration that Provo was the least-fun city in America. (Tribune file photo) David Kirkham, Utah tea party organizer, introduces Provo Mayor John Curtis at the Tea Party Express stop at the Historic Utah County Courthouse in Provo Tuesday March 30, 2010. (Tribune file photo) Provo mayor John Curtis reads from the Book of Genesis chapters 37-41 at Provo Community United Church of Christ's first annual Freedom Bibl-A-Thon on Friday, July 2,2010. (Al Hartmann | Tribune file photo) Provo Mayor John Curtis with wife Sue wave flags as they lead the Grand Parade on Monday July 5, 2010 through the streets of Provo. The Grand Parade is the largest of its kind in the state of Utah Ð highlighting freedom and promoting patriotism featuring local marching bands, floats, and giant helium balloons. An estimated 250,000 spectators were expected for the parade. (Rick Egan | Tribune file photo) Provo Mayor John Curtiss (yellow vest) talks to Provo policemen in front of the Provo Tabernacle, Friday, December 17, 2010. (Tribune file photo) Provo Mayor John Curtis speaks during a press conference about the Provo Tabernacle fire, at the Provo Council chamber, Saturday, Dec. 18, 2010. (Tribune file photo) Provo Mayor John Curtis speaks during a memorial for the Provo Tabernacle before the performance of Gloria at Utah Valley University in Orem, Sunday, Dec. 19, 2010. The piece was going to be performed at the tabernacle before it was destroyed in a fire. (Francisco Kjolseth | Tribune file photo) Because the Utes won the 2010 BYU vs. U of U rivalry game, Provo Mayor John Curtis, far right, and Salt Lake City Mayor Ralph Becker, left, pedal the approximately 50 miles from Provo to Salt Lake City in the third annual Rivalry Ride. After a brief ceremony at the Provo City Center at, 351 W. Center St., on Saturday May 7, 2011, the two accompanied by supporters headed out with a final destination in Salt Lake City at the City and County Building, 451 S. State St. Both mayors want to use the ride to acknowledge the success of last fall's BYU vs. U of U food drive and to encourage the public to participate in the upcoming Stamp Out Hunger food drive on May 14. Cans of food may be donated before and after the ride at the Provo City Center and Salt Lake City and County Building. (Francisco Kjolseth | Tribune file photo) Mayors John Curtis, Provo, Mike Winder, West Valley City, and Russ Wall, Taylorsville, from left, get the students at Mountain View Elementary moving with a rap about being Idle Free on Thursday, September 1, 2011 in Salt Lake City. The event launched Idle Free Awareness Month, a campaign that promotes decreasing excess exhaust contributing to smog by not idling in cars. (Al Hartmann | Tribune file photo) Barnaby takes the seat of his owner Qulatrics CEO Ryan Smith before a news announcement Tuesday May 15, 2012 in the company's headquarters in Orem as Provo Mayor John Curtis chats with Utah Governor Gary Herbert at right. The gregarious dog pretty much has the run of the company office greeting employees and soaking up attention. (Rick Egan | Tribune file photo) Provo Mayor John Curtis, says a few words after announcing that Provo will become one of Google's Fiber Optic cities, Wednesday, April 17, 2013. (Rick Egan | Tribune file photo) Kevin Lo, General Manager of Google Fiber, Gov. Gary Herbert, and Provo Mayor John Curtis, after the announcement that Provo will become one of Google's Fiber Optic cities, Wednesday, April 17, 2013. (Scott Sommerdorf | Tribune file photo) Provo Mayor John Curtis talked with participants as they registered at the Utah Valley Convention Center. Provo is attempting to set a world record for the largest scavenger hunt. It began at Utah Valley Convention Center at 1 p.m., and ends at 6 p.m, Saturday, September 13, 2014. Later, after the race began, participants would get extra points if they got a photo with Mayor Curtis. (Scott Sommerdorf | Tribune file photo) Provo Mayor John Curtis starts the scavenger hunt. Provo is attempting to set a world record for the largest scavenger hunt. It began at Utah Valley Convention Center at 1 p.m., and ends at 6 p.m, Saturday, September 13, 2014. (Chris Detrick | Tribune file photo) Provo Mayor John R. Curtis endorses Salt Lake City Mayor Ralph Becker for reelection during a press conference outside of the City and County Building Thursday October 22, 2015. (Scott Sommerdorf | Tribune file photo) Candidate John Curtis speaks at the Republican Special Convention for Utah Congressional District 3 to choose the candidate to replace Congressman Jason Chaffetz, held at Timpview High School, Saturday, June 17, 2017. (Chris Detrick | Tribune file photo) Provo Mayor John Curtis and his family wave to the crowd during the annual Freedom Festival Grand Parade in downtown Provo Tuesday, July 4, 2017. (Leah Hogsten | Tribune file photo) Provo Mayor John Curtis came on the stage carrying a thumbs up to applause. Americans for Prosperity-Utah hosted a 3rd congressional district candidate debate to replace Rep. Jason Chaffetz's vacancy. (Leah Hogsten | Tribune file photo) Provo Mayor John Curtis addresses the crowd. Americans for Prosperity-Utah hosted a 3rd congressional district candidate debate to replace Rep. Jason Chaffetz's vacancy. (Leah Hogsten | Tribune file photo) Provo Mayor John Curtis addresses the crowd. Americans for Prosperity-Utah hosted a 3rd congressional district candidate debate to replace Rep. Jason Chaffetz's vacancy. (Leah Hogsten | Tribune file photo) Third District primary candidate Provo Mayor John Curtis fields questions during The Salt Lake Tribune-Hinckley Institute of Politics debate, June 28, 2017 at the Utah Valley Convention Center in Provo. (Leah Hogsten | Tribune file photo) Third District primary candidate Provo Mayor John Curtis fields questions during The Salt Lake Tribune-Hinckley Institute of Politics debate, June 28, 2017 at the Utah Valley Convention Center in Provo. (Leah Hogsten | Tribune file photo) Third District primary candidate Provo Mayor John Curtis fields questions during The Salt Lake Tribune-Hinckley Institute of Politics debate, June 28, 2017 at the Utah Valley Convention Center in Provo. (Leah Hogsten | Tribune file photo) Third District primary candidate Provo Mayor John Curtis fields questions from the media after The Salt Lake Tribune-Hinckley Institute of Politics debate, June 28, 2017 at the Utah Valley Convention Center in Provo. (Chris Detrick | The Salt Lake Tribune) Provo Mayor John Curtis talks with friend Ray Beckham, of Provo, during his election night party at the Provo Marriott Hotel & Conference Centerr Tuesday, August 15, 2017. (Chris Detrick | The Salt Lake Tribune) Provo Mayor John Curtis reacts while learning he is up seven points in Salt Lake County during his election night party at the Provo Marriott Hotel & Conference Center Tuesday, August 15, 2017. (Chris Detrick | The Salt Lake Tribune) Provo Mayor John Curtis greets his supporters during his election night party at the Provo Marriott Hotel & Conference Center Tuesday, August 15, 2017. (Chris Detrick | The Salt Lake Tribune) Provo Mayor John Curtis and Governor Gary R. Herbert talk during his election night party at the Provo Marriott Hotel & Conference Center Tuesday, August 15, 2017. (Chris Detrick | The Salt Lake Tribune) Provo Mayor John Curtis celebrates with his wife Sue and daughters Nicole, Kierston and Sarah Jane during his election night party at the Provo Marriott Hotel & Conference Center Tuesday, August 15, 2017. (Chris Detrick | The Salt Lake Tribune) Provo Mayor John Curtis celebrates during his election night party at the Provo Marriott Hotel & Conference Center Tuesday, August 15, 2017. (Chris Detrick | The Salt Lake Tribune) Provo Mayor John Curtis celebrates speaks his election night party at the Provo Marriott Hotel & Conference Center Tuesday, August 15, 2017. (Rick Egan | The Salt Lake Tribune) Provo Mayor John R. Curtis, the Republican nominee for the 2017 special election in Utah's 3rd congressional district. Thursday, August 17, 2017. (Rick Egan | The Salt Lake Tribune) Provo Mayor John R. Curtis, the Republican nominee for the 2017 special election in Utah's 3rd congressional district. Thursday, August 17, 2017. (Rick Egan | The Salt Lake Tribune) Provo Mayor John R. Curtis, the Republican nominee for the 2017 special election in Utah's 3rd congressional district. Thursday, August 17, 2017. Provo • John Curtis points to the ceiling in his office where two of the tiles are a slightly darker shade of gray than the rest. “That’s where my foot came down,” he explains with a laugh. The 57-year-old mayor is a social media-savvy communicator whose phone chimes often with Snapchat alerts. He’s a ballistics devotee who can expertly track the trajectory of bullets. He used to sell watches from a rolling suitcase the size of a minifridge. And now he’s the Republican nominee (making him the automatic front-runner) in the race to replace former Utah Rep. Jason Chaffetz. But, it turns out, he’s no pro at installing furniture. A year ago, Curtis climbed into the vents above his desk to hang some glass shelves he bought online. As he fumbled around in the dark, his sneaker landed on an unsteady spot, snapping the tiles and sending a shower of white plaster — and one leg — into the space below. If you ask his wife, constituents, neighbors and business partners, they’ll suggest that’s just Curtis’ way. He spends a lot of time assessing what he can do, what he can’t do and how to do what he can’t. Critics say it’s tilting at windmills. Supporters call it dedication. It could be a little of both. “That’s part of his secret sauce of being able to get stuff done,” joked the mayor’s longtime aide, Corey Norman. Curtis likes to think that the itch to run for elected office might somehow be genetic. If so, he got it from his mom. Dawn Curtis served as the first female president of the Granite School Board in the 1970s. John Curtis, 15 years old at the time, remembers nailing photocopied flyers to telephone poles around the neighborhood for her campaign. “To be a woman running for the school board was no small thing,” he said. The experience also jump-started his own political ambition. Two years later, John Curtis was elected student body vice president at Skyline High School. It’s also how he met Sue Snarr. (Al Hartmann | Tribune file photo) Provo Mayor John Curtis and his wife, Sue, wave flags as they lead the Grand Parade on Monday, July 5, 2010, through the streets of Provo. Curtis’ first-period class for student government officers had one of the few telephones in the school. In early March 1978, a few days before prom, a girl walked in to make a call. “I was immediately struck with her,” Curtis remembers. He just couldn’t get his mouth to say so before she left. A few days later, he saw her again walking in the parking lot. “Who is she?” he asked his friend. “I’ve got to know who she is.” That night, with just her name and her number, Curtis asked Sue to the school dance. He drove a Triumph TR6 convertible. She wore a white dress with colorful embroidery from Mexico. He was enamored. She was a little uncertain. Exactly four years after that first date on March 17, the two got engaged and Curtis married into a family where politics seemed even more hereditary. Sue has served as the president of the Provo School Board. Her brother, Dan Snarr, was the mayor of Murray (and is running again this year). Her sister, Trisha Beck, was a state representative. And her great-grandmother was Martha Hughes Cannon, the first woman in the country elected to a state Senate seat. The two have been married now for 35 years, jumping from California to Virginia to Utah with six kids along the way. When he returned home from a two-year Mormon mission in Taiwan, Curtis had little money and less direction. “I have a business opportunity for you,” his uncle declared one day. The pitch on multilevel health product sales failed to capture Curtis’ interest. But an attendee at the presentation did. Curtis bumped into a sales representative for the Citizen Watch company and started working as his assistant in 1981. He cataloged the inventory, called jewelry shops and drove his Volkswagen beetle around the state to pick up supplies. Two years in, Curtis nabbed a promotion to sell watches on his own. In 1986, he was named the national company’s “Salesman of the Year,” graduated from Brigham Young University with a business degree and welcomed his first baby. “It was a full year,” he explained nonchalantly. He spent a decade working for O.C. Tanner before catching “an entrepreneurial bug” and leaving. 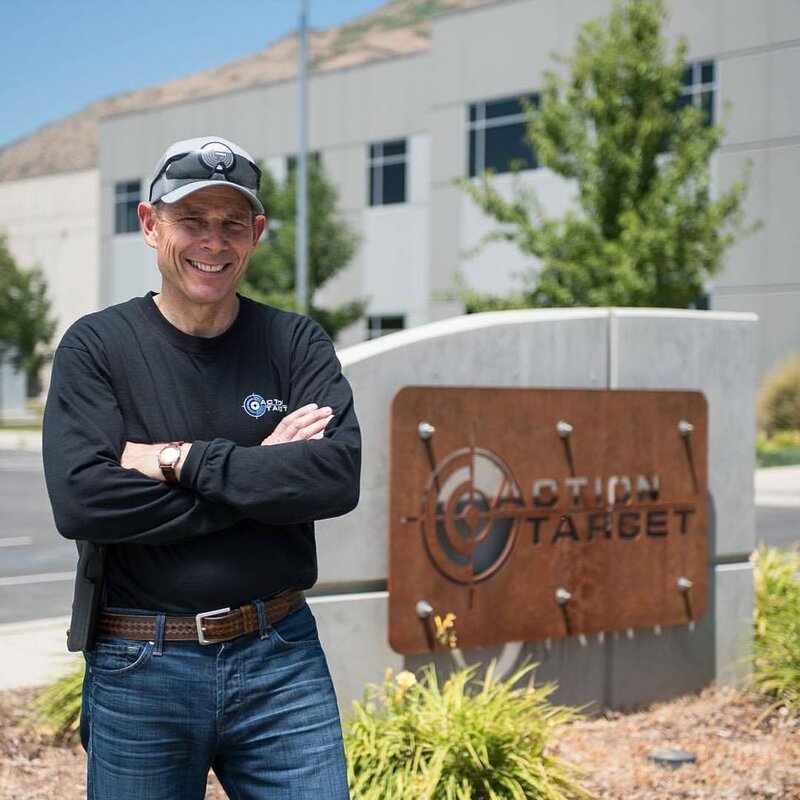 Then he spent a decade building Action Target, a shooting-range developer in Provo. (Courtesy| John Curtis campaign) Provo Mayor John Curtis stands outside Action Target in Provo. The scrappy business had been operating for two years before Curtis stepped in — “and it wasn’t really going anywhere fast,” said Kyle Bateman, company co-founder and Curtis’ cousin. The partners used their houses as collateral to guarantee the corporate debt. There were several weeks when making payroll seemed uncertain. And navigating regulations and taxation was often a challenge. Bateman credits Curtis for getting their heads above water (even if that still meant swimming in whitecaps for a few years). When Russ Evans moved to California for his retirement, he couldn’t get Provo off his mind. He’d lived there for much of his life. It’s where is he settled down with his wife, reared his kids, practiced his music. “I kept reading about what was going on [there],” Evans said. So he decided to make a quick visit back in June 2013. There was a band playing that he liked and maybe, he thought, he could shake off this homesickness. Evans loved the concert — part of the rooftop series initiated by Curtis. More so, he loved the transformation of downtown — a revitalization effort also kicked off by the mayor. He even loved the man himself, bumping into Curtis for the first time as the two rocked out near the stage. By January 2014, Evans was ready. He packed up and moved back to his hometown, opening Block 100 Antiques on Center Street and restoring the building’s original 1937 hand-painted storefront. 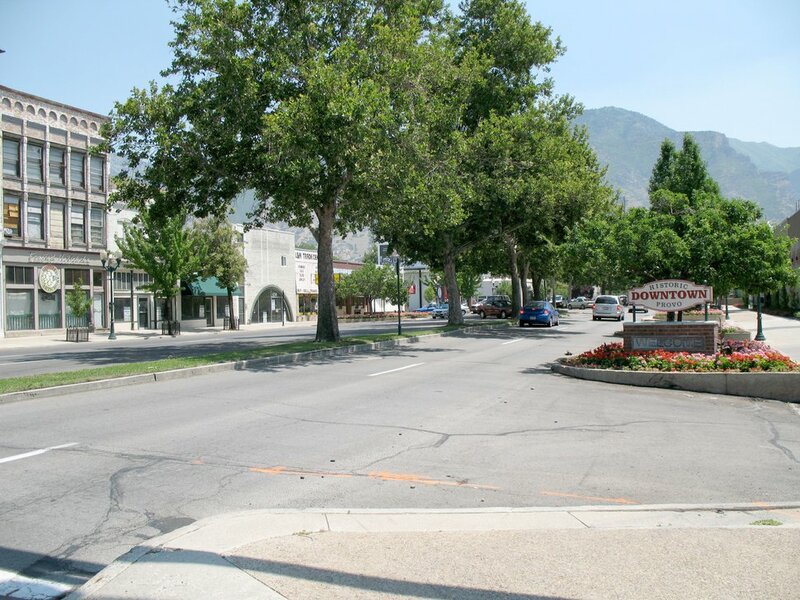 (Tribune File Photo) The 500 West-Center Street intersection is one of the downtown Provo features the city is looking at improving in its Downtown Strategic Plan. “That looks amazing,” he remembers Curtis shouting from his car window as he rolled by during construction. He stopped in a few days after the store opened, too. Evans, who describes himself as a proud Democrat, changed his voting status this year to Republican so he could vote for Curtis in the GOP primary. Since he took office in 2010, Curtis has worked to improve Provo’s economic development and downtown vibrancy (his favorite accomplishment). He’s launched clean air and recreation initiatives. He touts a 2.95 percent decrease in property taxes, and he did it with an 8 percent reduction to the city budget. (Tribune file photo) Provo Mayor John R. Curtis grabs Brigham Young University mascot Cosmo Cougar's tail at LaVell Edwards Stadium Friday May 7, 2010. Playing with Cosmo was one of many activities Curtis did on his 50th birthday to debunk a website's declaration that Provo was the least-fun city in America. Curtis lured Google Fiber, preserved Rock Canyon and launched a blog that’s now heavily read by residents. He’s also ridden a bike from Provo to Salt Lake City as part of a challenge, chased Cosmo the Cougar around BYU’s stadium to prove how fun the city is, read from Genesis at a Bible-a-thon and waved flags in the parade each year. The “Curtis for Congress” signs now hanging in shop windows and planted in yards throughout the city seem like a clear response to those efforts. Elaine Winger, 94, has lived in Provo since 1950 and knows the mayor because she’s challenged his policies. His responses have won her support. When Winger’s utility bill went up unexpectedly about two years ago, she emailed Curtis with some questions. A few days later, the mayor showed up at her doorstep. During his eight-year tenure as mayor, Curtis has repeatedly faced criticism from residents over Provo operating its own utilities (accompanied by rising rates of about $12 a month). And he’s been dogged by backlash over a Bus Rapid Transit project set to run through his city and neighboring Orem. Opponents say it’s too expensive, would have too few riders and would increase congestion for cars. Still, the mayor personally responds to every email he gets. Even the mean ones. Curtis pulls up the leg of his gray slacks to show off his socks. 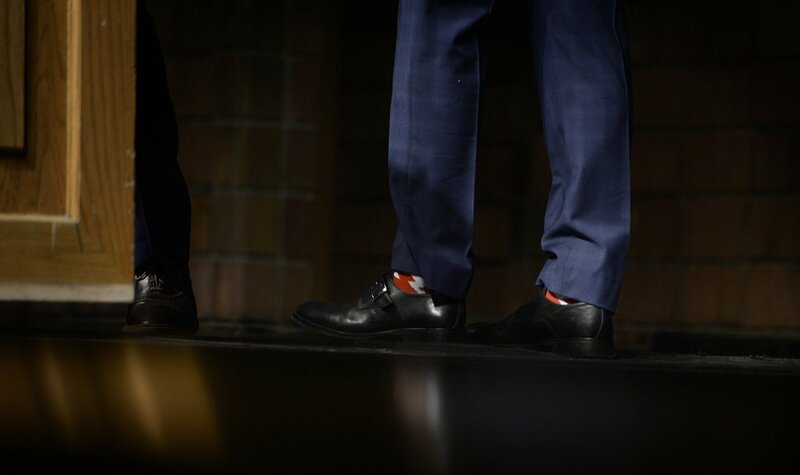 They’re red and black — “to match my tie,” he says. Colorful hose has become the mayor’s trademark. It happened on a whim. Scott Sommerdorf | The Salt Lake Tribune Candidate John Curtis made a point of showing off his American flag socks prior to speaking at the Republican Special Convention for Utah Congressional District 3 to choose the candidate to replace Congressman Jason Chaffetz, held at Timpview High School, Saturday, June 17, 2017. About five years ago, the mayor bought three pairs of the same obnoxiously bright striped socks at a department store. They were half off of half off, he says, relishing the good deal. When he wore them around the city, he felt like they helped break down barriers and start conversations. “People found that it was a way to approach me,” he explained. Curtis now has more than 200 pairs of jazzy socks, which Sue Curtis says he neatly matches up and pins together. Knowing her husband as that man — a neat freak who shines his shoes during football games and would be a professional organizer “in another life” — made it hard for her to watch as he was attacked during the Republican primary. Curtis was, for a short time, registered as a Democrat when he ran and subsequently lost a bid against state GOP Sen. Curt Bramble in 2000. Still, his anti-abortion, pro-gun-rights platform was typically GOP with a nod to moderate politics. He later returned to the Republican Party, launching and losing a special election campaign for retiring state Rep. Jeff Alexander’s seat in 2007. Sometimes three attack mailers would show up in the mayor’s mailbox in one day. He’s saved them all. “I have aspirations of making a collage, framing them and hanging it in my office if I make it to Washington,” he said. He’s serious. For the days he wasn’t so carefree about the unrelenting barrage, he coped with M&Ms and chocolate-covered pretzels. (Rick Egan | The Salt Lake Tribune) Provo Mayor John R. Curtis, the Republican nominee for the 2017 special election in Utah's 3rd congressional district. Thursday, August 17, 2017. A few days after the GOP primary, Curtis’ office is packed full of red, white and blue balloons. They’re nestled by the door and shoved behind his chair, stretching in columns from the floor to the ceiling. He sidesteps one stack to answer his phone. Utah Rep. Chris Stewart is calling to congratulate the mayor on his election night victory. “Congressman, it’s so nice of you to reach out,” the mayor says. It was no surprise that Curtis won the party’s nomination last month. His triumph was predicted in every poll — tracking fairly closely to the 11 percentage point lead in the final canvass. Curtis initially hesitated to jump into the special election race, though, agonizing over the decision for weeks while 20 competitors signed up. Part of him is still shocked at his success. “Let me just tell you that I wrote two speeches for tonight,” Curtis said at his primary election night party, ripping a paper that held his would-be concession. In the reliably red district, where registered Republican voters outnumber Democrats nearly 6-to-1, Curtis is well-positioned to knock out a win Nov. 7. He faces Democrat Kathie Allen, who’s amassed nearly $700,000 in donations, the United Utah Party’s Jim Bennett, son of the late three-term Sen. Bob Bennett, and a handful of independent and third-party candidates. Curtis’ two priorities for Congress match what’s already being discussed at the Capitol, albeit without results so far: tax reform and health care. Curtis certainly hasn’t been shy about criticizing his party for not having a plan ready to replace Obamacare. He’d like to see more innovative solutions, including using pretax dollars to pay for premiums, developing a $35-a-month plan for low-level coverage or crowdsourcing with citizens for more ideas. With the current model for taxes, he said, there are “some glaring problems.” Curtis believes the system should be simplified by closing loopholes and leaving deductions just for charitable contributions, children and home mortgages. Chaffetz, who stepped down early and is now a contributor on Fox News, was criticized in his final months for not doggedly investigating President Donald Trump as he did Democrat Hillary Clinton in his role as Oversight Committee chairman. Curtis didn’t vote for Trump, opting instead to write in a “good friend’s name.” He wants the president to be successful, though, and will work with the White House agenda when he agrees with it. To help explain how he’s arrived at his policy positions, Curtis points to objects on the shelves he so haphazardly hung a year ago. On display are pieces of his life and experiences that he says ultimately led him to the current moment — a 3-D-printed model of Provo’s Mormon tabernacle-turned-temple, a football helmet from BYU and a gun from Action Target. “It’s not loaded,” he assures.